Filament Games, in collaboration with Adtalem Global Education and its Ross University School of Medicine, are pleased to announce that their healthcare mobile app, Saving Lives!, has been awarded a gold medal for excellence by the 2018 International Serious Play Awards Program. July 9, 2018, MADISON, WI - Filament Games, in collaboration with Adtalem Global Education and its Ross University School of Medicine, are pleased to announce that their healthcare mobile app, Saving Lives!, has been awarded a gold medal for excellence by the 2018 International Serious Play Awards Program. Saving Lives! is a CPR/AED simulation game for EMS, medical, nursing and allied health students and professionals. 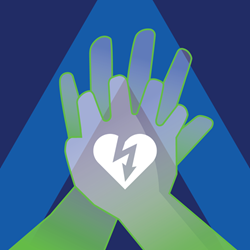 Aligned to American Heart Association Guidelines for CPR and resuscitation procedures, the app helps players practice basic life support skill sets by administering CPR to a patient in a simulated emergency scenario. Saving Lives! is a core title in a collection of cutting-edge digital applications and games that enable students and professionals in the medical, healthcare and veterinary industries to study, develop, and practice their skills. This affordable, award-winning collection of apps was designed and developed by academics, and is already being used by hundreds of students worldwide. Saving Lives! aligns well and supports the goal of better preparing future physicians and nurses to meet future global healthcare needs. Universities including Ross University School of Medicine are currently in the process of establishing American Heart Association training sites on their campuses; mobile games like Saving Lives! reinforce the traditional teaching paradigm by providing students with “anytime/anywhere” learning experiences for these important life-saving skills. Dr. Eric B. Bauman, PhD, FSSH, RN, Assistant Dean for Technology Development at Adtalem Global Education’s Innovation Team, worked with a talented group of subject matter experts and designers to bring this game to life. Saving Lives! was envisioned by Ross University School of Medicine alum Dr. Michael Nemirovsky where it served as his capstone research project during his patient safety fellowship, in which he was mentored by both Dr. Bauman and Lisa Buckley, PA-C from Ross University School of Medicine. Dr. Nemirovsky is now a resident at MVHS-St. Elizabeth’s Medical Center in Utica, NY. The Saving Lives! award will be celebrated with the rest of the winning titles at this summer’s Serious Play Conference Events, held at George Mason University July 10-12, 2018 and University at Buffalo July 17-19. The rest of the winning titles can be reviewed in the Serious Play press release. In addition to the awards celebration, Eric B. Bauman and colleagues Lisa Buckley, and Reid Adams, MS from Ross University School of Medicine, as well as Filament Games’ CCO Dan Norton will be on a panel at the Serious Play Conference at George Mason University, entitled “Embedded Subject Matter Expertise in Game Dev for Healthcare,” where they’ll share insights gained from the Saving Lives! development process as well as broader perspectives on game-based learning and healthcare. The same group will also be speaking on a panel at the University of Buffalo Serious Play event, entitled “The Role of Embedded Content on Healthcare Training Products,” with Filament Games CEO Dan White. To learn more about the mobile app collection, visit http://www.app-clinic.com. Filament Games creates digital experiences that expand a player's way of thinking. Their approach to game-based learning has the power to engage, inspire, motivate, and educate. For the past 12 years, Filament has used this approach with partners all over the world to create more than 100 best-in-class digital learning games across every subject area and age group. The purpose of Adtalem Global Education is to empower students to achieve their goals, find success, and make inspiring contributions to our global community. Adtalem Global Education Inc. (NYSE: ATGE; member S&P MidCap 400 Index) is a leading global education provider and the parent organization of Adtalem Educacional do Brasil, American University of the Caribbean School of Medicine, Association of Certified Anti-Money Laundering Specialists, Becker Professional Education, Carrington College, Chamberlain University, DeVry University and its Keller Graduate School of Management, EduPrisint, Ross University School of Medicine and Ross University School of Veterinary Medicine. For more information, please visit adtalem.com.